We pride ourselves on the outstanding service we provide to our clients. The passion to organise and create events has become our profession, which has lead to the creation of Niche Events. Endless Possibilities: Niche Events, The Only Events Company you will need. 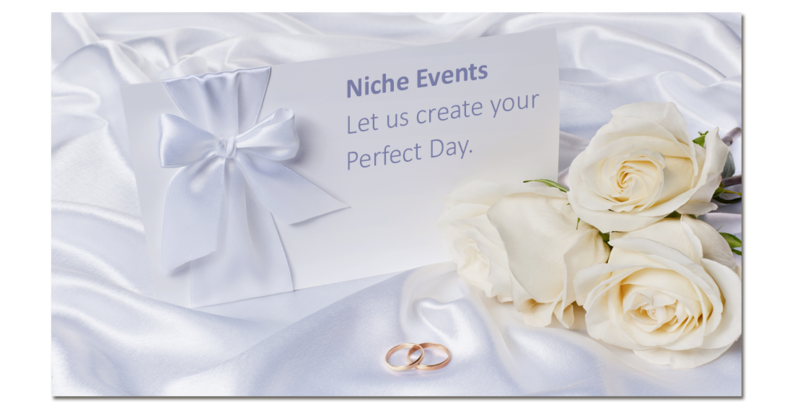 Welcome to Niche Events, we specialise in offering a complete planning, venue styling and floristry service for Weddings and Events in Wiltshire ,Gloucestershire, Oxfordshire, Hampshire & Berkshire areas. At Niche Events we offer a full range of décor including Chair Covers, Sashes, Draping, Light up signs, Centerpieces, Dancefloor, Sweet Treats and Flowers to compliment everyone’s weddings and event themes, whatever the look…be it vintage, rustic or even those who love a little bit of sparkle. …there’s something for all…So why not get in touch and see how we can work with you to give you the wedding you have dreamt of. We are preferred suppliers within many prestigious venues and have a reputation for the first class service and quality products we offer. For further information on how we can help you transform your day why not book an appointment at our new showroom in Swindon, to come see us and one of friendly members of staff will be happy to go through your requirements. Some of our other great services we can offer. Wedding Planning, from the whole day to the final touches. Niche Events were amazing and considered everything I asked for and done it to the most amazing standard. The girls were just amazing setting up my room late at night and came back early in morning to finishing touches. Nothing was too much trouble and I would recommend to everyone; in fact, I already have! Hi Niche and Team, We just thought we would send a message to show our appreciation for everything you for our Sarah’s Wedding. It was all such a lovely finish and thank you for being patient with her over the last few months. We will be recommending you to all our friends and wish you all the best on everything you do. Your parents must be very proud of you. Mr and Mrs Ellis.